No worries on Pulau Lang Tengah... white beaches, crystal clear seas and tall palm trees: the most quiet and least touristy of all the islands near Malaysia's east coast. An ideal place to snorkel or dive as the house-reef around the island is part of a nature reserve. Do make sure to visit between March to mid-October, out of the monsoon season and for divers: in March and April visibility can reach up to 40 meters. Bring your credit card or some cash to pay for diving or snorkel trips, as well for guided nature walks. If you want to safe some money on boat trips, you can just start your dives from the beach. I am staying at the Sari Pacifica Resort and Spa, all inclusive, which is a small boutique resort and spa with wifi. Nothing much to do in between snorkeling waiting for a relaxing massage on the beach it seems. There is also a jungle trek which I will sign up for maybe tomorrow, maybe as the one I am interested in will show the beautiful sunrise, yet it starts of course way early in the morning... Further on it's a good idea to book an all inclusive package, as there aren't any other real restaurants to be found on this uninhibited island. You can reach Pulau Lang Tengah after a 60 minute boat-ride from Merang. Or you can take a boat from the nearby islands Redang and Perhentian that are much more commercialised for tourism, meaning that lots of corals has been stepped upon. 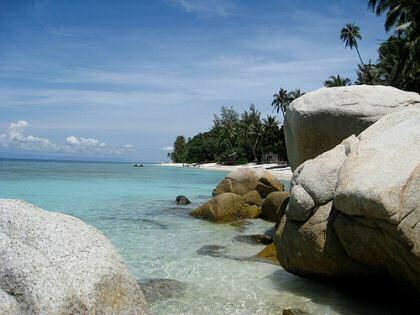 For more peace and quietness nearby, also Pulau Kapas and Pulau Gemia are recommended.